Being bowl-bound, your betta relies on you for home decorating. Adding ornamental touches, such as plants, to his home will make his environment interesting and give him places to explore, hide and rest. You shouldn't just dig up any old plant and stick it in with your fish. Choose one that is not only decorative but betta-safe to enhance his life. Bettas don't require the presence of live plants in their bowls, so when you decide to spruce the place up with the addition of some greenery, you have a choice between real plants or plastic. Your betta will welcome either one: he will appreciate being able to hide amid the leaves, whether real or plastic, and you may even find him lying atop one of them, if the leaves are flat. Live plants will help keep the water cleaner, and provide extra oxygen for your fish's use, so you might be leaning toward getting your little guy a real plant for his place. You'll need to keep an eye on the foliage, though. Some live plants will grow and spread and could end up crowding your fish, so you'll need to remove excess pieces. Others may die after a while. If you notice that your betta's plant has turned brown, you should remove it from his bowl, as it will release toxins that may make him sick. When selecting live plants for your betta's bowl, you can choose from plants that live under water and can be placed directly in with your fish, or those whose roots are the only parts submerged, with the leaves sprouting up out of the top of your betta's bowl. Java moss is one of the betta-safe plants that will live underwater with your fish, and it is effective at keeping nitrite and ammonia levels down. Chinese evergreen is another plant you can put in the water with your betta. 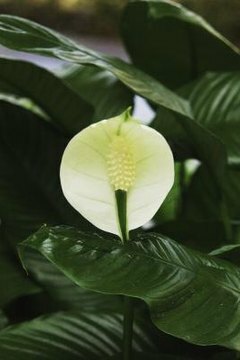 If you would rather have a plant that can serve the dual purpose of providing decoration for your living space as well as environmental enhancement for your fish, submerge the roots of a peace lily or a philodendron in his bowl. Remember to thoroughly wash all the dirt off the roots before putting the plant in your betta's water. Some people choose live plants over fake because they've heard somewhere that live plants cut down on maintenance. Overall, that isn't really true. While your betta may nibble at the leaves or roots of any live plant you put in his bowl, he can't live off the plants as a source of food. You will still need to feed him every day as usual. Also, real plants do provide a minimal filtering effect to the water, but not to the point of reducing the number of times you need to change it. Even with a live plant, you'll still have to change the water and clean his bowl once a week.